Samurai Warrior Full Tang Wakizashi Sword With Leather Scabbard | BUDK.com - Knives & Swords At The Lowest Prices! Our new Samurai Warrior Wakizashi Sword is a stunner, featuring hefty full-tang spring steel construction. The 14" blade is hand sharpened with a piercing point and a traditional blood groove. The ornately designed handle features ray skin with black cord wrappings and a cast brass-plated menuki. A leather scabbard houses the blade. I bought this months ago and since I am loyal to budk and would hate to ever say anything against them, I was reluctant to leave anything other than a five star rating- however I have to say something. This sword/dagger is cool looking, but it is basically just for show. I do some sword training with a group of local martial artists and for a small demonstration I decided to buy this sword. After the demonstration I inspected the blade, only to find it was slightly bent and the wrapping on the handle was coming off after just one use. On top of that, the leather sheath began to come apart and fray after just a handful of times of pulling the blade out. Overall, I think this item is worth $25-35 tops. It's construction is definitely cheap and as far as swords I've purchased from budk go, this is probably among the worst. take my advice, spend this money on another sword from this site. 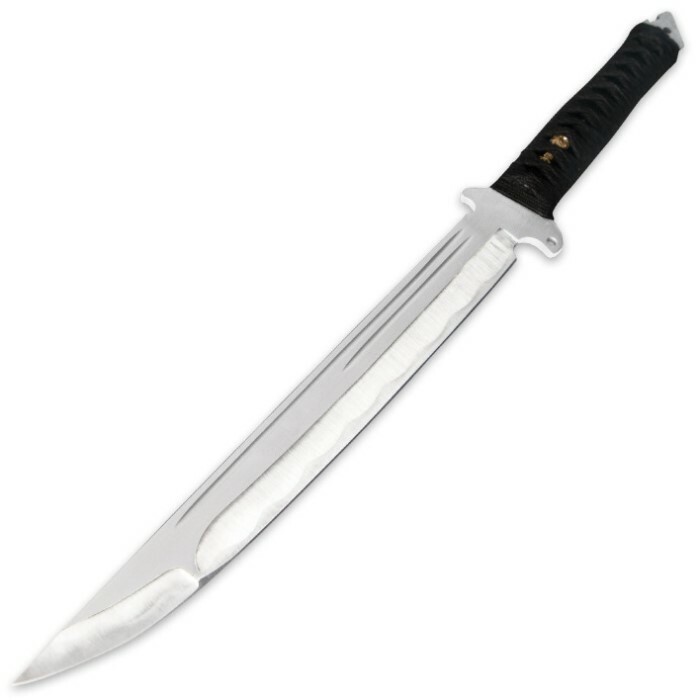 A friend asked me what sword I wanted as a gift and I had been eyeing this one for awhile, so I told him about it. I was quite pleased with it. It has a thick blade (three stacked nickels thick, for reference). I haven't chopped or hacked anything with it, so I cannot reference its performance. I honestly wasn't expecting it to have a real ray skin wrapped handle and I wasn't surprised when it felt like a faux ray skin handle. Ray skin tends to feel like a stone texture not like rubbery plastic. Unless rays are starting to feel like rubber due to all of humanity's polluting of the ocean, I'm going to have to call it out for not having a real ray skin handle. I really like it nevertheless since it was all I was expecting so I'm keeping the five star rating alive for it. It will be a fitting sword to wear on the hip since it is borderline to being a big knife. I just felt it was important to write a review for it addressing that it doesn't appear to be real ray skin. I just received mine a week or so ago excellent for the price as all ways Kennesaw cutlery fast delivery. This is a quality sword/knife hefty and feels strong in the hand. decent edge and sheath. Highly recommend to anyone looking for a big knife thanks again Kennesaw. I received this sword a day ago, and I couldn't be more pleased with it. This is no paper thin hedge trimmer, this is a quality weapon. This is a great fully functional tool.It is not razor sharp, it has an axe -like edge.From my research i have found it to be made of 65Mn steel.The blade handles extremely well and the sheath is OK for the price. Over time the handle wrap may become loose , but that is only an excuse to customize it. 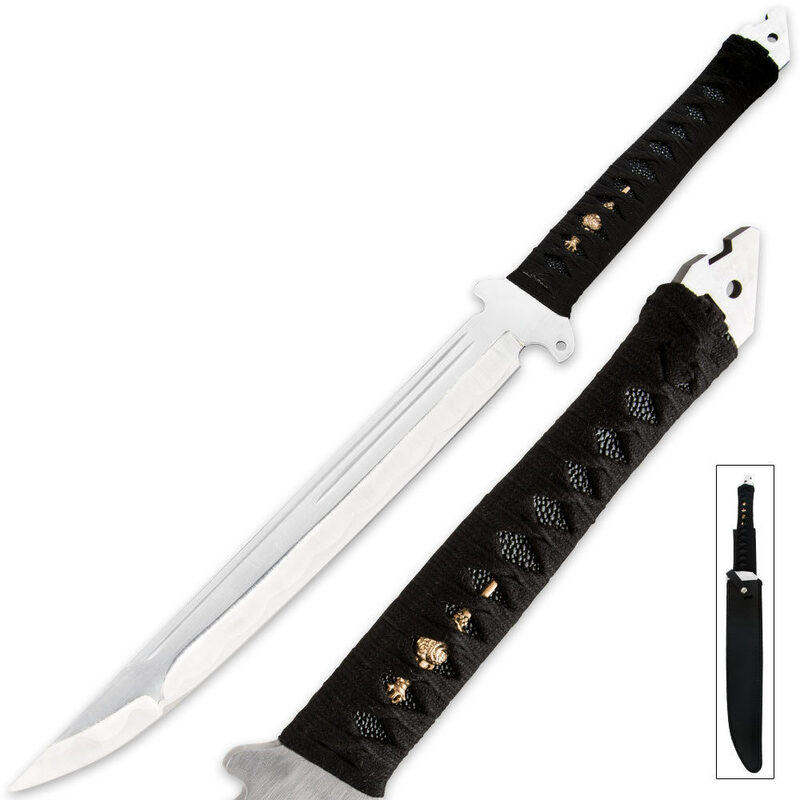 This is a perfect self-defense/ survival sword.